An initial letter is a large first letter of a paragraph, set in a decorative or graphic way. It offers a visual cue that can signify the beginning of an entire work, such as a book or article, as well as chapters or significant paragraphs within a work. Initial letters liven up a page by adding color, emphasis, and typographic interest. Scribes used fancy initials to begin chapters and decorate pages in medieval manuscripts – long before the invention of moveable type. The appearance of very simplistic initial capitals dates back as far as the 5th century. Their design and complexity expanded in the highly decorated illuminated manuscripts of the 8th century and onward, with very ornate initials gracing the pages of religious and historical texts. After the use of hand-set metal type became widespread in Europe in the 15th century, decorative initials still held a place of importance. Space would be left at the beginning of selected passages for initial letters to be drawn in later by a scribe or illustrator. They might consist of geometric shapes and patterns, or contain organic elements such as foliage and animals. Some incorporated biblical and historic scenes, and these were referred to as historiated initials. Oftentimes they were decorated with gold leaf, thus the term illuminated manuscript. 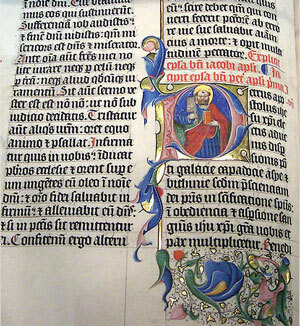 An illuminated letter P in a Latin Bible dated A.D. 1407. Today, initial letters continue to enjoy an important role in typographic communications, adding emphasis and decorative appeal to a page. The two most common styles of initial letter treatments from which most others are derived, are Dropped Initials and Raised Initials. A dropped initial top aligns with and drops below the first line of text. This is probably the oldest, and most common, form of initial letter. A raised initial (also called stick-up initial) is one that base-aligns with the first line of type and extends above the body copy.